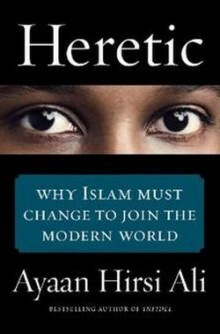 Ayaan Hirsi Ali’s new book, Heretic: Why Islam Must Change to Join the Modern World, hits bookstores tomorrow. Hirsi Ali made a National Writers Series appearance in 2012 speaking with guest host Jack Segal before a sold-out audience at the City Opera House in Traverse City. Hirsi Ali was also featured in the March 19, 2015 New York Times Book Review “Ayaan Hirsi Ali: By the Book” in which she shared her favorite authors, books she read while growing up, and what books are currently on her nightstand.